The first editorial, “50 Years of Fidel Castro” 3 March 2008, celebrated a political revolution that changed the world, and spelt the end of US-Western imperialism. This editorial celebrates a spiritual revolution that may also change the world, spelling the end of Western materialism, and spread from there. We are talking about processes, not events, and of structures and cultures more than of actors. Again, Cuba played a major role, as meeting place between two major parts of Christianity, Catholic and Orthodox. In the Great Schism of 1054 they had excommunicated each other; and the Roman empire had split Catholic/Orthodox in 395. Fidel’s Catholic brother and successor Raúl was a condition for this historic meeting for peace; so was the meeting between Putin–an Orthodox Christian–and Francis in June 2015. However, not many pairs of brothers rival the two Castros in shaping history. They met, Pope Francis of the Catholic Church and Patriarch Kirill of Moscow and all Russia–after earlier meetings between popes and the patriarch of Constantinople–with a Joint Declaration on 12 Feb 2016 in 30 articles. There were 17 quotes from the Bible; showing that they are “brothers in the Christian faith”, “pained by the loss of unity”, “divided by wounds caused by old and recent conflicts”. Not from the Bible are the many references to “the Most Holy Mother of God, Virgin Mary, and the saints we venerate”. Problematic for Protestants. The bulk of the Joint Declaration is about the fate of Christians in the Middle East, meaning mainly Orthodox; like “the Metropolitans of Aleppo, Paul and John Ibrahim, who were taken in April 2013, to make every effort to ensure their prompt liberation”. However, together they “invite our Churches in Ukraine to work towards social harmony”. They also jointly argue strongly against abortion and euthanasia, and in favor of “respect for the dignity of the individual called into being according to the Creator’s plan”. Do not destroy God’s creation. Historically the Declaration seems to underestimate the political separation already from 395. And “May the Blessed Virgin Mary, through her intercession, inspire fraternity in all those who venerate her”, “reunited–in the peace and harmony of the one people of God” excludes Protestants, humanists, other religions. But: this meeting was to heal the Schism; blunting that sharp faultline through Europe, EU. “He visited a prison, greeting inmates one by one, urging them to live as “prophets,” to turn their suffering toward goodness. “Work”, he said, so that this society which uses people and discards them will not go on claiming victims”. If only that message of decency, of human worth, could have been amplified, in English, to the United States, across the river to Texas, and beyond to Washington.” (INYT, 19 Feb 2016). Cuban president Raul Castro, left, with Russian Orthodox Patriarch Kirill at Jose Marti International airport in Havana. Across that border a “Widening gap in wealth plays out in–growing disparity in life spans of rich and poor Americans” (INYT, 13/14 Feb 2016) and “Why are white death rates rising?” (INYT, 23 Feb 2016). Difference in life expectancy between top and bottom 10% in income is not new: for men born in 1920 it was 6 years. For those born in 1950, living more of their lives under present conditions, the difference is 14 years (from 5 to 13 for women). Substantial portions of their lives have been taken away. The death certificates will point to many causes compatible with more misery at the bottom (but less so for blacks). A comparative study for Muslim societies would be interesting. There is much inequality, but is there suffering at the bottom? “All are equal under Allah” implies that all have equal life (expectancy) chances. The implication is basic needs for everybody, if necessary by the rich in resources sharing with the poor. The hypothesis would be lower gaps and less widening of the gaps. Are all not equal under God? 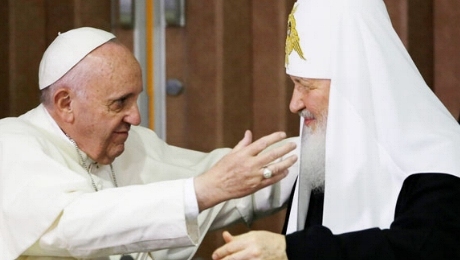 Pope Francis and Patriarch Kirill are silent; class is absent from their declaration. Their concern was direct, not structural violence; cultural not structural harmony. May we hope for spiritual improvement to cover God’s creation more equally? He calls, at the US border, on rich countries to open their gates to the poor, invoking the Biblical story of Nineveh and God’s messenger Jonah “to wake up a people intoxicated with itself”. “The King listened and Nineveh was saved” (INYT, 20/21 Feb 2016). John Paul II broke down the West-East Iron curtain; “Francis’ walls are between the north and south of the world”. But, what is his positive economic message? “–the private ownership of goods is justified by the need to protect and increase them, so that they can better serve the common good; for that reason, solidarity must be lived as the decision to restore to the poor what belongs to them” (Washington Post, 29 Nov 2013). He argues in favor of taxation and regulation to distribute; but his key argument is spiritual: solidarity, loving your next like yourself; your brother and sister (in Christ). We sense a major problem. Only a minor part of the world’s 1.2 billion Catholics live in the USA; the country is evangelist. Christianity is compatible with rising inequality; the road to dignity is paved with individual hard work, not social solidarity handouts. Even a World Council of Churches in Geneva on the Francis line might not impress the true believers in the USA. And then, what? Pope Francis: US self-destruction, by its failure to follow Nineveh and wake up. A key message from Cuba “at the crossroads between North and South, East and West” (the Joint Declaration). This article originally appeared on Transcend Media Service (TMS) on 7 Mar 2016. Anticopyright: Editorials and articles originated on TMS may be freely reprinted, disseminated, translated and used as background material, provided an acknowledgement and link to the source, TMS: A Pope, a Patriarch, a Spiritual Revolution, is included. Thank you.